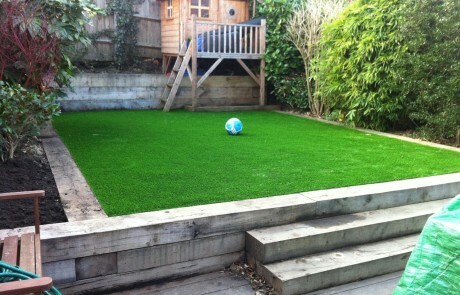 Whatever your artificial grass requirements, we can help. 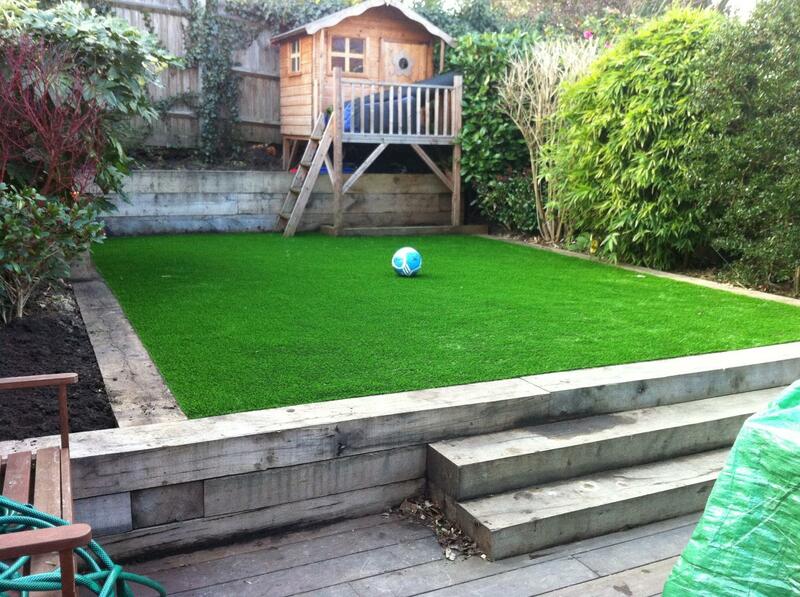 Artificial grass, which is sometimes called fake lawn or grass carpet is an excellent alternative to grass or turf. In many ways artificial grass… or ‘better grass’ as we often call it, has come on leaps and bounds in the last couple of years. 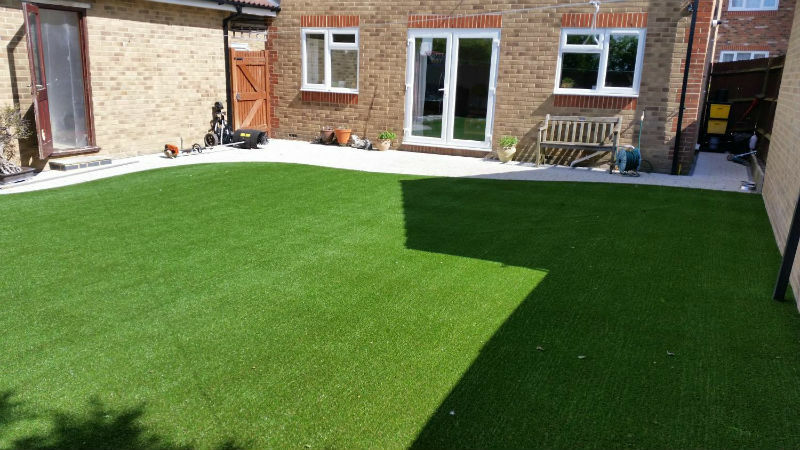 It now comes in many colours, including pink and it can also be supplied and installed in different lengths, meaning you can have that ‘just-cut’ look, or your ‘grass’ can be a bit longer, so it’s softer, giving you that ‘grown-out’ look, feel and style. 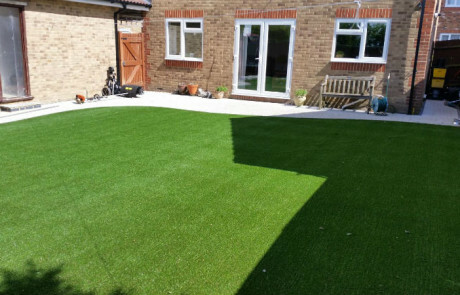 If you’re looking for a realistic and virtually maintenance free area for your garden in Saffron Walden, Cambridge or the Bishops Stortford area, that you can enjoy all year round, artificial grass really is unbeatable. 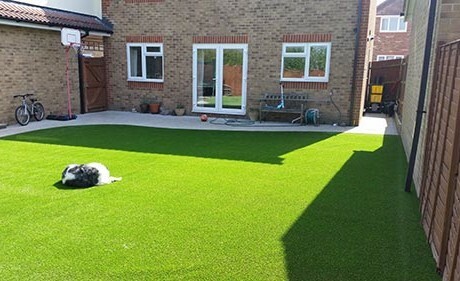 For Dog lovers, artificial grass can be perfect (if installed correctly) as cleaning up after your pets is a doddle, simply pick it up, use a hose or watering can and it’s as good as new. Unlike real grass, which can stain from urine, artificial grass will not, and your dogs won’t be digging either, so you’ll have a great looking lawn that’s perfectly green all year round. Blowing the leaves off in Autumn can be as simple as getting a Blower on a dry day, or brushing it off, saving you lots of time and if you have Children, they’ll be less likely to bring the outside dirt in, keeping your house cleaner too. The result, is an all year round, easy to clean, easy to brush, beautiful looking lawn, without the mess and hassle, so you have more time to enjoy your garden for longer. As an approved installer with one of the UK’s leading artificial turf manufacturers, you can rest assured that when it comes to installation, we’ll get it right. As with most jobs, when it comes to installing an artificial lawn, preparation is the key. Our trained landscaping and lawn professionals will get the job right so you can rest assured, your new maintenance free lawn will stand the test of time and appear as good as new for many years to come. Weeds, mud, moss and stones will be a thing of the past, and with the right sub base and a breathable membrane installed, your ‘Greenman Grass’ will not turn into a paddling pool, as with other badly fitted low quality artificial grass products. Sell your mower and put your feet up!